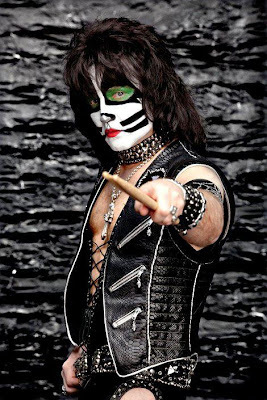 KISSopolis: Eric Singer: "This Is How KISS Exists In 2013"
Eric Singer: "This Is How KISS Exists In 2013"
In a recent interview with Radio Nova in Helsinki, Finland, KISS drummer Eric Singer talked about the future of KISS. When asked: "Will KISS continue with new members in the future?" Eric Singer: "Look, the one thing I've learned in life, not just in KISS, but in life...just take it one day at a time. The interesting thing that I always find, that people will ask, not just interviewers but fans in general, you could be on tour, like right now we're here today...2013 playing a show in Helsinki, and everybody wants to ask you whats going on tomorrow? It's like...well what about today? Or they all wanna ask you about the the past I mean...you can't change the past and you don't necessarily know what is going to happen in the future. But we do know one thing for sure, we are here today and we're gonna play and put on a great show. So I learn and try to take that attitude of live in the moment, live for today, and I'm not saying you don't have to think about tomorrow, but don't worry about tomorrow. Yesterdays gone. Tomorrow you don't know whats going to happen, so just live one day at a time, try to learn to live in the moment, I think that's important thing is that just everybody...hey, there could be NO KISS right now, anymore, so the people that want to complain about "I don't like this or I don't like that, they should play this song, or I only want the original band", the bottom line is this is how KISS exists right now, in 2013. Be glad that there's some version of KISS and that we're out there touring. Hey, we have just as much passion and care just as much as the band ever did or ever could, and that's what counts, if we didn't we wouldn't be here...you think...I mean Gene and Paul don't need the money they don't need to do this, they do it because they love doing it."